And now for something a little different - I'm co-hosting a workshop. BACKGROUND ARTWORK: Blue Lagoon (4), 2016/17 by Veronica De Jesus. Courtesy of Anglim Gilbert Gallery. Want to learn how to embrace and deal with life’s hiccups while living abundantly, healthfully, authentically, and fulfilling your goals? 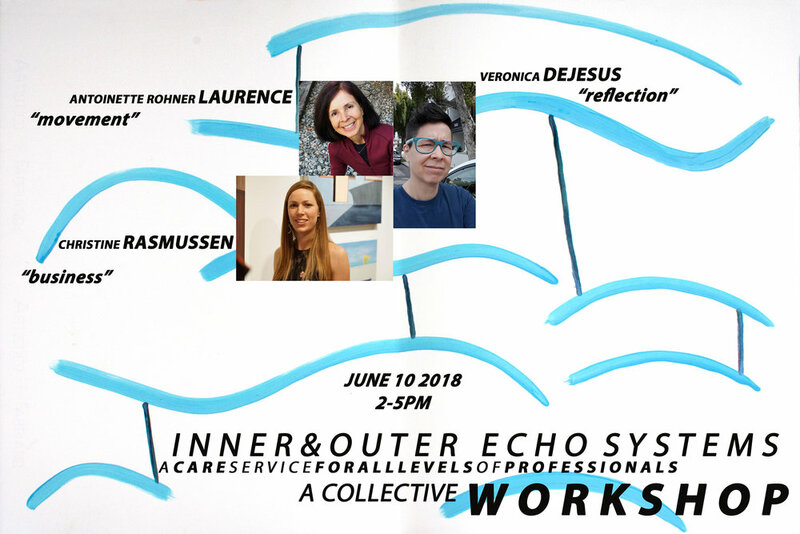 This 3-hour collective workshop combines movement, professional practices, reflection and a hands-on design session to offer professionals and creatives practical, applicable tools for inner self-care within the context of life’s hurdles. Workshop participants will leave feeling grounded, prepared, purpose-driven and on track. ANTOINETTE ROHNER LAURENCE is a Qigong teacher with a 30+ year practice and a certified acupressurist. CHRISTINE RASMUSSEN is an exhibiting painter, freelancer and connector committed to helping artists improve their business practices. VERONICA DE JESUS is a visual artist represented by Anglim Gilbert Gallery with work in the permanent collection of the Berkeley Art Museum and author of “People Are a Light to Love” published by Rite Editions in 2017. Building Bridges Art Exchange's (BBAX) mission is dedicated to cultivating cultural understanding through the arts. 50% of donation will go to supporting BBAX's programs.